Past the 12 week mark, cleared to do limited running! gocanes123 has completed the grueling 26.2 ATR miles to full recovery! Goal: 236 days from the surgery date. Hi All, it has been quite awhile since I posted an update, and, just a few days shy of my 8 month post-ATR mark, now seems like an appropriate time. The past couple months since my last post I have had ups and downs trying to get back to my sport of distance running. Some weeks were good and pain free, some I struggled physically and emotionally, wondering why I would feel great after one run, and can barely go a mile the next week. After awhile I learned to take what my leg gave me, never too push to far, but also to make sure to keep active as possible in terms of PT and other exercises when I could not run. With that being said, I completed my goal this past weekend of running the Philly Half Marathon. It was something I signed up for the day after my ATR, as a goal to reach at 8 months, and one I thought could be realistic. At times over the past couple months I had a lot of doubt whether or not I will be able to run it, or if it was a good idea to even bother doing so at this stage. The week prior, I said to myself that I will attempt it, and try to cross the finish line. If it took me 3 hours fine. If I was struggling and had AT pain I would stop. But, I owed it to myself with all the work put in to at least try. I ended up, on a picture perfect day, exceeding my expectations and my family/friends as well. I finished the race in under 2 hours, 1:54 to be exact, at a 8:42 pace. My slowest race I have ever done by about 10 minutes, but time was really irrelevant. It was really just a 13.1 mile celebration of how far I have come, and how much I appreciated being out there. For those behind me, its a long haul and there are always going to be good weeks and bad weeks, but with hard work we all will be back to normal at some point. I still have some ways to go, and I hope by my 1 year mark next March, I can say I am 100%, and ready for the Spring racing season, putting this ATR ordeal behind me for good. Happy Healing! Its been a month or so since I posted, and normally I talk about progress, but at this moment in time, heading into month 6, everything has seem to come to a screeching halt, and I am not entirely sure what this means, and what to do. August was a tale of two completely different months for me. The first half was great, AT wise. Soreness was mostly non existent, I could do 20 plus single leg heel raises, and the same with eccentric heel drops, and per my PT, I began a 3 day/week running program. As I discussed before, what started out as awkward and slow running in late July, quickly became more of a free-flowing comfortable pace run, as I realized muscle memory from years of practice and competing is a great thing. I was getting my speed close to a 10:00 mile, had good form, and was going up to 5 miles, complete with pre and post run stretching. Everything was great, and by now I expected to be going past the 5 mile mark. I saw my ortho in mid August for a follow up, annd got all good news: I was cleared for light hill work, and to just remember to keep my mileage under 5 a day, for another month or so. I made one more appt for mid Oct, and then that would be it with the doc. PT i was only going to continue for a couple weeks. The past 2 weeks have been the complete opposite…I can barely get a run in w/o discomfort from the base of the ankle where the AT attaches up the calf. Its concerning for a few reasons: I work on my PT exercises daily, have never pushed more than what my PT recommended, and generally have been listening to my body. I took the past week off, enjoyed the Labor Day Weekend, and then tried to pick up where I left off yesterday…flat trail running, and see how far I go. I had to stop a mile in and walk back, the third time I stopped in my past 3 workouts after a mile or so. The pain is not excruciating or even intolerable, but it aches, and I don’t want to push an ache until I hear a pop. Even during rest, I feel twitches of discomfort in my AT leg, although I am still able to do single leg calf raises as I was a month ago. I’m not really sure where to go from here, part of me wants to contact my ortho for an MRI, but the other part says thats a waste of time. There was no definitive re-rupture. Is rest the best medicine at this point, and a classic case of too much too soon? I was told many times by my ortho I would be able to run Thanksgiving day races, and thought that Sept would be my greenlight to resume official training, but its just going in the opposite direction. Anyone going through, or has gone through, something similar at this stage, I would take any advice I can get, before I call the ortho. Thanks everyone. Its been a few weeks since I did a post, and I thought as I hit, and pass, the 4 month mark of my ATR, it would be an appropriate time for an update. As I may have mentioned in a previous post, my day to day life is as it was previous to my rupture. I no longer have a limp, and general walking does not lead to soreness anymore. I do get some swelling from time to time by days end depending on the shoe I am wearing, and try to ice daily. I continue to go to PT once a week, and along with two legged and one legged eccentric heel drops, and plyometric work, my PT is pleased with my progress. At this point I could probably do 10-12 one legged calf raises on my injured leg, althought by my last couple reps I know I am not getting full extension. The biggest issue I have with PT is continuing to do my exercises at home, and not to solely rely on running or biking to enhance calf strength. I try to do calf raises and the heel drops on a stair daily. The most exciting news for me is my start to the return of my sport, running. I am going out on flat surfaces, both trail and concrete, about 3 days a week, with my other days divided between strength training and PT. During my runs I tend to always use my compression socks, and focus on form rather than speed. Over the past 3 weeks or so I have progressed from a mile to upwards of 3.5 miles of running, and, as tolerated, my PT continues to say I can add a mile a week. This past weekend was a annual 5 miler I tend to do every summer that helps support a local charity. It’s a flat race on a soft dirt trail. I decided to sign up for it, knowing that I could not actually race it, nor run the whole thing, but thought it would be great mentally to get out there and be in a race environment as I hit my 4 month mark. I ended up running a little over 3 miles, then mixing walking/running over the last 2 miles, and I finished in 54 min, about a 10:55/pace. I checked my statistics from last years same race, which I did in 36 min at a 7:20 pace, so I still do have a long way to go. But, I am back out there, moving again, which is something I could not do a month ago, and each step I take I am very thankful for. This injury humbles you and makes you appreciate how great an active lifestyle is. As I progress over the next month I hope to add mileage and speed, and as Fall comes I can begin training in earnest again. I have my next doc appt in 2 weeks, which may be my last follow up unless need be. The most important thing lesson at this juncture, or when you begin your return to your sport, is to do so slowly and find that right balance. Time to see what month 5 brings. Happy Healing everybody! Hey all, brief update on where things stand as I begin Week 14 post-ATR. Took an extra long weekend for the Fourth up to Boston, first time there and what a great city. Over a 5 day span did tons of walking and was only sore the first night I was there, after a 6 hour car ride up, my leg got pretty stiff. I brought my boot as a just in case thing, but kept it in the car trunk the entire time. I seem to be pretty good with walking, no limp, and I could probably go a few miles at this point w/o feeling any ill effects. I did two walk/run sessions since I was given the OK by my doc and PT. My first was last Tuesday, when I did 4 miles total on a flat dirt trail, and over the 4 miles, I did three separate 5 min intervals of very light running, trying to focus on good form and not overdoing my stride or anything. It felt ok, still a long ways to go of course, but we all have to start from the beginning again for the most part. That was followed by the trip to Boston and a lot of walking. Yesterday, I did the same exact route as last week, except did 20 min total (5 min interval again) of light running spread over the 4 miles. It went a little better than last time, althought I was a bit more sore waking up today than last week. I go back to PT tomorrow, at which point I’ll see if he is OK with this continued incremental increase as the weeks continue. I also am back in dress shoes at work for the first time rather than my more supportive running shoes, so we’ll see if I can make it through the day in those. After a long 3 months of ups and downs, milestones, and minor setbacks, I finally heard the words out of my doctor I have been waiting to hear since I first suffered my ATR; that I can begin light running, mixed with walking, and take it as tolerated on flat surfaces of course. 5 min, followed by walking, wash, rinse, repeat, and begin to pick it up as tolerated. I do not see him for 6 weeks now and at that point he hoped to clear me for full activity, which would be 4.5 months out from injury. This appt was preceded by PT last night, which was my first attempt at tredmill use to date. I was very hesitant at first, especially after last week when I was so sore/a bit swollen from an hour of a stationary bike and elliptical, that I could not do anything but get stretched an iced the previous session. This past weekend, I swam Sat, did 45 min on the elliptical Sun (and Fri night went to a concert moving quite a bit sans boot, it if offically retired) and was a bit sore yesterday morning, but nothing like the prior week. Back to the tredmill, he had me walk for 2 min, then he put the speed up to 5.0, or a light run speed. I kept my hands on the handles as first, then he promised I could let go and nothing will “pop.” I put my trust in him and “ran” for 3 min, which was the most uplifting feeling that my calf was able to do that, but also comical at how poor my running form was. It looked like I’ve never done this before. After that, I did light plyometrics, iced and called it a day. I expected to be sore this morning, but aside from the usual aches and pains, nothing noteworthy. Week 11, noticeable progress, AT Brace use? Hi all, a shorter, brief update as I enter week 11. I am not seeing my doctor until after the 12 week mark, so not much professional feedback other than the progress I have made on my own. I am now able to walk a mile in 2 shoes pretty easily, and this past weekend did 2 miles on a dirt trail with little discomfort. My limp is pretty much gone at this point as well. My pushoff on my injured leg is not where I want it to be of course, but I notice a fair amount of calf strength returning compared to the way it looked and felt after week 7. Like others, I have some stiffness in the AT each morning, but as I get moving it works itself out. I have not retired my boot yet either, as when I am in crowded places I still feel safer in it. When sore from walking last week I also put it on at the gym to do upper body. By week 12 I hope to officially retire it. I am going to PT twice a week, and he has said my ROM is great and I am progressing nicely. I plan on continuing the 2x/week PT for maybe one more week or so as it does get expensive, and a lot of the exercises I can do at my own gym. My doctor said starting this week he will be OK with me starting the elliptical, something that I will verify with my PT tonight. It would be a welcome change from the bike, which to me is hard to do for more than 30 min w/o the boredome setting in. Like starting with the bike about a month ago, the question of how much resistance to use and how hard to push in general on the elliptical at this point in recovery is something I can forsee having a hard time deciding on. I am so close to that 12 week mark, and I want to stay on the recovery path, and not have to utter the word setback. My July 1st doc appt is something I am greatly looking forward to as I may be cleared to begin light running. I go back and forth with thinking if I am ready for that, as last week after a 1 mile walk I was quite sore, and then after a 2 mile walk this weekend I felt more than able to keep going. I am nervous to say the least but with two full weeks to go I may feel more ready. One thing I have been contemplating, is buying an achilles brace for running. I am looking at the Bauerfeind AchilloTrain AT Support brace, however it is really pricy. Does anyone have any experience with a brace like this? Would I get the same results from something cheaper? Or, is it even worth wearing one to begin with? I have compression socks, but want to be as fully prepared to run, and do so safely, in a few weeks, and if this is a very helpful piece of equipment I would not mind spending the money. Well, this doesn’t appear to be as brief a post as I thought after all. And, for those behind me, at week 6-7 I could barely limp in sneakers 1/4 mile and had no pushoff, now pretty close to a full pushoff and measuring my walks by mile, not feet, 4 weeks later. Week 9, Finally PT, 1 month till Running? Now at 2 plus months out from my partial ATR, I think the most consistent information I contantly get is from this blog, as it seems every time I go from one professional to another, a different opinion surfaces. In my last post, I went on and on and on about being told to wait on PT after week 7, when so many of you in your recoveries were well on their way in the PT process. Fortunately, those issues got solved, albeit a week or so later than I would of liked, as I started PT yesterday. Over the past 2 weeks, I generally have stopped wearing the boot unless I am in large crowds or for a couple hours in the office if I am sore. I am starting to pick up the pace of walking, really focusing on getting a full heel to toe stride, and have stopped limping for the most part, unless I do a bit much, and I feel some sharp pains the next day. This past Sunday, I took a 2 mile walk in sneakers, did 3 X 20 calf raises and some other resistance stretching, and with some bad drivers out there causing many break slams, I was fairly sore yesterday, which is why I am glad at PT we mostly talked, did measurements, and he showed me a couple new stretches. The only thing with my PT is he is definitely not up to date on modern protocols. He was very surprised as an avid long distance runner I did not elect for surgery as he compared my achilles to a rope that has 50% of its fibers sheared off, and when I run long distance I am taking a gamble every time of a complete rupture. I assumed whatever percentage tears, whether its 10% or 50% knits back together. He even went as far as suggesting if its not too late, to get a surgical repair now as to not risk a future complete rupture during training or races. I was really taken aback by this and told him I would discuss with my doc today. The PT came highly recommended and I feel confident he could get my strength and range of motion to improve, but I think he is off base when it comes to the non-surgical vs. surgical approach. He also stated I could ride a stationary bike with a decent amount of resistance w/o risk. Today I discussed this all with my doctor, and he did not approve of the PTs advice to say the least. As at previous appts, he assured me, with the placement of my partial rupture, he has full confidence with proper rehab that I will get back to my pre-ATR self. If I was a good candidate for surgery, he would of recommended it. It gets tiresome to constantly get differing opinions from professionals, but I think it is a bit crazy to suggest surgery 9 weeks in! I’ll listen to my doc on this one. One last note: The doctor said I could begin an elliptical in 2 weeks, but to still take it easy on the bike for now. I have not done more than 30 min with the highest resistance being 8 for the past 2 weeks. Unfortunately, while it gets my legs moving, I am not working a sweat or getting much of a cardio workout. Anyone in my timeline post-ATR have success working on the bike/elliptical at at least a moderate level? The highlight of my appt was the doctor saying at my next appt, after week 12, he may clear me for light running. If that happens, I would be quite happy to say the least. Lots of rehab and strengthening to go until then. Week 7…2 Shoes and Driving! I just had my Week 7 doc appt, and like with my Week 5 important, more progress, and some more questions. Since being told I could begin driving and going 2 shoed in the house only, I really still kept conservative and did no driving and was FWB in my boot all week 5. During week 6 is when things began to slowly pick up as I began driving a little more each day, which culminated in my first drive to work last Friday. I was very relieved I had the ability to drive again and never thought I would be as happy fighting traffic as I was that day. Also last week I went without the boot in the house, and put on two shoes for walks around the block. They were very slow, very short walks, my poor calf had nothing to it and I was getting basically no push out of it, but I thats to be expected I guess. We all have to awaken those unused muscles somehow. This being my seventh week, Post ATR, my latest appointment involved more good news. Unless I am in crowded, public places, I got the ok to go 2 shoes when out and about! While this is great news, I am still really hesistant to be anywhere w/o my boot that involves lots of people, and my version of a lot of people is not that high of a number, more of me being extra-cautious than anything else. I plan on leaving the boot at home, or in the car, for work starting tomorrow, and will try and not wear it as much as possible. The best part of my appt was getting the ok to do the stationary bike at the gym w/o a boot, on low resistance. I can also do pool work, upper body weights (with boot on) and core work while at the gym. This is very exciting for me as I am really starting to notice the changes from not being active over the past 7 weeks, and I don’t like them at all. Not being able to drive, and not having free weights at home to use, I have not had much of an opportunity to exercise other than ab/core work on a mat at home, and that only takes you so far. My only concern from the appt, and I mentioned this on my last post, is the lack of PT. I thought I should of begun a PT program after Week 5, but after discussing with people on the blog, I was OK waiting till week 7. Today, my doctor tells me that between a bike, walking in 2 shoes, and a pool if I can get i one, he does not want me to start any formal PT yet, at least not until my week 9 appt. His argument was because I’m on the younger side of the injury (27) and a runner, he wants to see how I progress in 2 shoes and what strength I get back on my own before sending me to a PT. I tried to explain to him how concerned I was with this, and that walking, biking and a pool are great forms of strenghtening, but to get with a trained professional, to learn different stretches, and make sure I am doing them correctly is really essential to my rehab. Its not just the calf that is weak, its the whole leg, my posture, etc. At this point, I may call a PT on my own and see what he recommends. What do others think? Should I try the walking and biking for 2 weeks then hope that he gets me into PT, or do I go on my own and work with someone on the side? I dont want to do much, but I also do not want to do little, and i feel like I am on that fine line. From reading people ahead of me in recovery I know how essential their PT was/is. And ppl behind me who are beginning PT are seeing benefits. With that being said, I have my gym bag and I am ready to do my first cardio workout in 7 plus week tonight, looking forward to it! 5 1/2 weeks and 1st Milestone! Today is my offical 5.5 week mark and yesterday was my 5 week doctor appt, and I have definitley been through what feels like a lot over the past few days as compared to the past 5 weeks. From reading the progress of people ahead of me Ive noticed that there a periods where a lot seems to happen over a short period of time, followed by a lot of stressful, slow progress, during this long road. This past weekend I traveled to Pittsburgh for Marathon Weekend, and it was hard to watch and keep a smile on my face at the same time. I traveled to Pittsburgh last Friday and went to the convention center that night to pick up my bib number and goodie bag, trying to feel as much a part of the experience as I could. That was probably the lowest point for me emotionally, as I was ot only discouraged amongst a sea of able-bodied athletes, but I also left my crutches in the car to go FWB for the first extended time. And, it was really, really, really sore. I did not know if it was something I needed to get used to, or if my AT was not ready for that at the almost 5 week mark. To make a long story short, I stuck with it throughout the weekend, walking w/o crutches as much as possible and as awkward and somewhat comfortable as it was, by Sun night I was getting used to life without crutches. I was fortunate enough to also be with my girlfriend and other friends who were running to try and keep my spirits up. Watching the marathon Sunday morning for the first time as a spectator was very tough, but also very inspriring. It showed where I was, where I am now, and where I want to be over the next several months. A hard feeling to describe. But, I got through it, and by Monday my quads and thighs were so sore it felt like I had run a race! It was also my first time “walking” in 5 weeks. For my 5 week checkup, I did not really expect much out of it. I expected to be brought down from 2 wedges to 1, and be told to keep trying to FWB w/o crutches and do some light, non-resistance stretching at home, and hold tight till week 7. I mentioned in my last post how I thought my doc was being too conservative and I planned on pushing for PT as soon as possible. At my appt, he moved my foot back and forth and every which way, and I had no pain, and my motion was not as bad as I thought. He was happy with my progress and not only took both wedges out of my boot (I am now flat-footed) but also said at my 6 week mark this Sunday to go to a parking lot, try pressing the breaks, and if I feel comfortable I can start driving next week! Further, next week I can also go 2 shoes in the house and test that out. And by week 7 I would likelly be 2 shoes full time if everything goes ok. I was a bit speechless as I thought this was maybe too much too soon, but was really encouraged. Has anybody experienced this much transition so soon? I will test driving this weekend, and if it bothers me I will not try pushing it, but this is happening 3 weeks sooner than expected, and just to get some of my independence back is huge. He wants me to not start PT for another couple weeks, and do non-resistance stretching at home (I still would like to start PT sooner), and said I could get in a pool and ride a stationary bike with the boot on for now. I realize over the next several weeks as a transition out of the boot things will be crawling, just trying to walk normal and not be scared of steps or curbs or wet floors will keep me occupied. Any sort of fast walk or jog probably is at least 4-5 weeks away still, but this is the first part of my marathon where I got good news, thus the long post. I’ll see how I feel in the flat boot and how driving in an empty lot over the weekend goes, but i’ll take what I can get. I’ll try not be as long-winded in the future, but this is one of the better weeks so far. Hey all, as I just completed my four week mark, here is to hoping I am halfway there until I am in 2 shoes (I am shooting for Memorial Day Weekend). In the meantime I attempted to go FWB w/o crutches this weekend, and maybe it takes some time, but I feel more mobile getting around in the crutches than that slow, awkward hobble that I attempted yesterday. Four weeks ago I could barely use crutches and now I feel like I am more of a pro than I would of ever hoped with them, so I’ll keep trying to slowly ween off of them. Im am still having spasms this week, but not nearly as bad as week 3. One concern I have is that I am reading some people are getting on a stationary bike 3-4 weeks post op. I am non op and was told I probably would not be using the bike until I can come out of the boot, probably 8 weeks + out from rupture. I realize every doctor has their own protocol, but is that worth questioning? I want to do nothing to delay or jeapoardize the healing process but I am concerned about the atrophy and stiffness, along with the lack of activity for so many weeks. This weekend will also be my first time spectating a road race as I am going to support friends running the Pittsburgh Marathon. It will be quite a different experience, but it could be a good psychological boost to remind me of where I want to be in 7 months. After that, my 5 week appointment, where I maybe have a wedge removed from the boot. 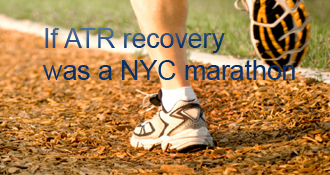 Congratulations on posting that first half-marathon post-ATR! That has to feel really good at this point. And it just gets better from here! I’m 13 months post-surgery now and have experienced big gains in running strength and speed these past four months. Everything is much more consistent and predictable. Judging from where you’re at now, at 8 months, I expect you’ll really be tearing it up by the time a year rolls around. Wishing you all the best. What a wonderful way to celebrate your recovery, it sounds like the ultimate personal best to me. All the best to you for your next race! That is awesome!! Well done! Congrats!! as gravity said, don’t care too much about the time, and in any case, below 2h is quite good considering the probable lack of endurance training. I am hoping to be able to complete a short distance triathlon in October (1y post ATR). fingers crossed! Thanks to you both! It does give me confidence going into Spring that I was able to accomplish this doing an injury rehab rather than a normal training regimen. And, with some dedication and perseverance anyone can do a race like this, which is why it is one of my favorite lengths! Another well done. Unless you have been a distance runner it is difficult to understand the amount of effort that goes into training. Your time is more than respectable consdering the huge layoff which basically means you started your half marathon training from zero in the tank plus an injury rehab. Big effort for 8 months. Wow - great pace!!! I know it wasn’t a PR for you but still rather impressive. Most people without an ATR injury couldn’t do it in that time. Congratulations on getting back out there. I’m still not sure of how far I want to do but you give me hope! @gocanes123 - Even at 6 and 7 months there would be times my achilles rebelled against the running. Rest from that activity always seemed to help. I did a lot of biking and still do. For those of us who ran before, we knew how to add mileage and speed. Post ATR or post achilles surgery, those same rules just don’t seem to apply. It’s much more incremental. Sometimes there is a step or two back before there’s forward progress again. Give your achilles a chance to completely calm down. Then start back up, slower and shorter than you want to. Maybe warm up on the elliptical first. Best of lucky to you. I know you’ll get there! Thanks smick, I’ve taken most of the past week off and the tendon definitly calmed down from where it was last week. Ive never been much of a biker, but if my runs continue to be futile, biking is something I will take up. I worked on the elliptical and stationary bike at the gym on high resistance and am fine with that…running is just not agreeing me right now, but Im hoping with a bit more rest I can try and get going again. Sorry to hear about your setback. running has been problematic for me as well and I never got to your distances yet! Everytime I try to even jog for 10 minutes during a thirty minute walk I get near immediate achiness and some lingering pain the next day. Plus I was getting pain in my other knee to boot! It drove me to cycling, which has proven to be great cardio, amazing for my leg strength including calves, and completely pain free! I’m biking around 80 miles a week and just did a 35 mile ride to 4k feet of climbing and my achilles feels great! Not to mention no aches in my other joints! I’m still mixing in some light jogging once every other week in hopes my achilles starts to complain less, but in the meantime I’ve been walking and biking. Thanks norm, quick update…I went to see my PT yesterday to figure out what was going on, and he wasn’t too concerned. He did some stretching then put me through my usual PT drills including using the ladder. As he said to me previous sessions, there are ebbs and flows with this injury, you have good weeks and bad weeks. So I’m just going to back off on the running for now and concentrate on cross-training…he agreed that rerupture at this stage was not of high concern. I’ll see what happens over the next week or so and take it from there. Also, the pins and needle feeling has gone away, not sure what that was about. No idea. You have been doing (what I call) a ton, so backing off and resting doesn’t sound like a bad idea, even if it didn’t help over Labor Day. Otherwise, ask for professional help, and good luck. I don’t think AT rerupture is a concern, but there are other ways to injure a recovering leg. I did get that same feeling of tingliness or numbness on the ball of my foot when doing single heel raises, walking or running. It was never long lasting so didn’t particularly bother me. I haven’t had any symptoms like that for at least a week now. Thanks both for the feedback…I also forgot to note that I have some tingling going through the base of my foot up to the toes…similar to the sensation of your foot “falling asleep” Again, not sure what this means, or if anyone has experienced this symptom, but I do have a call into my PT for advice. I’m about the same stage as you. I am able to run and there is a bit of a twinge at the start but this quickly disappears. Like David says I think your PT may have more answers initially. This advice was passed onto me by a marine, it may not apply to your situation though. He was finding that whenever he ran he had to stop due to tendonitis pains in his normal uninjured achilles. PT visits, icing and rest didn’t seem to help. He started doing long walks up hills and mountains. After doing this for a while he was able to run pain free. Maybe something to do with the way the achilles/calf gets slowly stretched when walking up steep inclines, but he swears by this as a cure for achilles troubles. Thanks Kim! I really appreciate your input, it gave me more confidence on my run this weekend, and, after a few days off it was a pain free one and felt great! @gocanes - You know, even at 9 months I’ve had a few very mild achilles flare-ups on my good leg, but nothing that lasts. From 4-5 months, I had flare-ups on both sides, and sometimes had to cut back or take 2-3 days off between runs. At that time I began doing hip/core stability exercises and I’m still doing them (Oregon project/Myrtle). The things that seem to help the most are always stretching achilles, hamstrings, quads, hips post-run. Then a 5 minute soak in icy water. If I’m experiencing any mild soreness or swelling, I use kinesio tape. Still doing hip/core strengthening and stability exercises. For what it’s worth, I think you are way ahead of the curve in your return to running! Great news! What a wonderful place to be at in 4 months. It is a great inspiration for me. So happy for you to be back out there running again! I found the compression socks along with a quick icing after each run to be very helpful. I still ice after a hard run or a long one. I wish you well as you enter month 5! It all sounds brilliant. “This injury humbles you and makes you appreciate how great an active lifestyle is.” should be a sticky on this site. Great stuff, glad that at the 4 month mark you are able to run. That is somehwere I want to be. Sounds like great progress with patience and determination thrown in! Love reading these blogs of those of you ahead of me. Good to hear what lies ahead. Must be amazing being back in proper shoes. Can’t imagine getting to that stage. Good luck with it all and keep us updated. Thanks Kim! Your exactly right, I did a 4 mile walk yesterday, and ended up doing a little over a mile of running during that time. It felt great at the time to do a mile but I was decently sore by the end of it. And, I was out and about the rest of the day so I have been sorer than normal most of today, and did a lot of icing. By the end of four months, if I can get 1-2 miles of running w/o soreness I’ll be encouraged. @gocanes123 - Congratulations on your progress! I do know how great it feels to begin the return to running. For what it’s worth, I found the 12 weeks - 20 weeks period to be really slow in terms of progress in the running. The tendon was always a little sore after the run and I never skipped the post-run icing. From 5 months on, the progress was MUCH quicker. Best of luck to you! I am in my 13th week. First week out of the boot (3 weeks NWB, 9 weeks in boot). Congrats on your recovery progress! It’s always nice to read what I have to look forward to. Boston is a great city - glad you enjoyed my hometown! Wonderful progress! continued success in your recovery. Yup, sounds good to me. And patience is one thing I sorely lacked, although I have had to learn some over the past almost 3 months. I did 30 min on the bike up to a 9 resistance by the end and between 80-90rpm thoughout, followed by my first time on the ellipical for 20 min, with a few levels of resistance mixed in. Today, no extra soreness like I expected. I am encouraged for the next couple weeks based on this. It really sounds like you have a switched on PT and I am sure you are very aware of your body. The biggest issues with running are of course the increased load and the extra flexion needed and I understand completely the curiousity. Been there too so good luck with it over the next few weeks. It is a good feeling. The problem when you start running again is maintaining the patience to do it within your limitations. It seems patience is one of the many things we take out of this injury. Thanks for the perspective, at PT yesterday I did mostly mostly balancing exercises where I was doing all sorts of movements and rotations while balancing on the bad leg. It felt good in the sense that my calf was firing. Today I am going to try a combo of the stationary bike and the elliptical for the first time. It is exciting to add another piece of cardio to the regimen. As I move closer to week 12 my PT said he is going to have me do “modified” plyometrics and “simulated” running exercises to prepare me for the month ahead. I am not entirely sure what those exercises entail, but I am excited and trust him that it will be of great benefit. Like you said Stuart, I’m not expecting the day after my 12th week is complete to actually run, but am curious to take a few running steps and see how it feels, and if I experience a similar “ouch” reaction. Norm you probably did the smart and safest route to return to your sport, I wish you can pass a little more patience over here! Being a distance runner the motivation to run again was very strong. About week 12 I felt I could run a little but my PT told me to wait. I of course thought better and while I was walking around the olympic rowing course I took a couple of steps into a jog. That was it. Back to walking. Big ouch. A few more weeks past that and I was more ready. I found it much better to build things up walking up hill and on uneven ground. Another very helpful thing my PT put me on to was the mini tramp. I used to laugh when I saw them sold as a piece of exercise equipment but they are fantastic for this injury. She would get me to jog 3 steps then stop and balance on one leg for a short time then continue and balance on the other leg after the next 3. Do that for 10 minutes and you get lots of muscles worked. If you’re mostly looking at exercise to rebuild your strength and function (as opposed to running because you’re going nuts without it! ), I tend to be a wimp. Many people who push hard to rebuild their atrophied leg ASAP seem to have setbacks, or flirt with chronic pains. Your leg has been loafing for a long time, so just walking around a lot and doing the ADL that you’re comfy with (for me, that included bicycling around town, sailing and racing small boats, and walking around a sailing club that was littered with huge scary pine cones!) will be “serious exercise” for your weak and still-rusty leg. Others disagree, of course, and recommend a more targeted body-building approach to rebuilding the weak body parts. I waited ’til around 10-11 months to return to my “poison” (competitive volleyball), though others have returned quicker — though often not playing all-out, as I did from the start. yeah, I messed that up, I meant that for gocanes. It is definitely a high risk period. Personally, I started strengthening with standing calf raises with an isometric hold around week 10. Now around week 12 I’m getting close to 50% of my weight on it so its going well. But I agree, my main point is that the calf muscles are probably going to feel sore before any indication from the AT. How far you want to push that is always a big question. Roark, your comment of June 4th, 2014 at 10:54 am is addressed to Sporti, but seems to be intended for gocanes? I agree that strengthening the Gastroc and soleus need levels thatmcause muscle fatigue and soreness, but I think 9 weeks is too soon to work on muscle strength, because those muscles are still attached to an impaired AT. At least until the risk of rerupture and other serious AT setbacks has passed, I think all lower leg exercise on that side must be tailored to the needs of the AT, though it leaves those calf muscles atrophied a while longer. The rest of your body can be sore after a workout, including your other lower leg, but I think this one should wait for muscle fatigue. Muscles are good at signaling when they’ve been overstressed (though sometimes slow), but vulnerable ATs are pretty mute until they’re injured. Yeah, I’d actually prefer X2 because its better for sport performance but I was able to get my wife to do X3 because the workouts are shorter and easier to modify for beginners. I was amazed how good some of the training has been for rehab. When I ruptured initially I thought I was going to be sitting out the rest of the program, but once I realized I would be fine as long as I wore the boot it became a great way to maintain fitness. gocanes, I would definitely say take it easy until any sharp pains die down. Maybe put the boot back on just to do a workout so you don’t have to worry about it. gocanes123’s AchillesBlog is proudly powered by WordPress and WPDesigner..